I Felt Like I Belonged! We talked for a little while as I told him about the story I wrote about him as a student. He didn’t remember which came as no surprise to me. He has helped thousands of students in the past and to him it was just a part of the job. To me it was a caring teacher coming to my rescue. I suggested that we meet somewhere and talk but I could tell his defenses were up. “I don’t know”, he went on to say. “It depends on what you are going to write about me.” As I tried to explain what my story might be about I felt a slight nervousness as I talked. It was like going back over forty years and trying to get my teachers approval and a good grade. The fact was I wasn’t quite sure how I would write the story and I think it showed. As I was talking an idea came to me. Maybe I could take a baby step and just ask him a question or two over the phone. I had read some articles written about the event but none of them seemed to go into much depth. He seemed comfortable with that so I asked the question I hadn’t seen asked before. What did it feel like being on that mound at Wrigley Field? He pondered my question for just a few seconds..”that is a very good question”, he replied. Just then he informed me he had another call. “Call me back in 5 or 10 minutes”, he said and we quickly ended our chat. When I called back ten minutes later I had taken the time to write more questions down. It proved to be a wasted effort as I reminded him of the original question. He again assured me that it was a very good question. Then without warning I could feel his defenses come down. His answer was amazing and articulated his feelings more than I had ever expected. “I felt like I belonged there”, he started. Tony explained that having the baseball background and story with the Cubs helped with that feeling. “I felt like I wasn’t just a veteran asked to throw the pitch, I felt I belonged because of my connection to baseball.” They had me warm up in front of the dugout with Justin Grimm, a pitcher for the Cubs. “I threw maybe 10 balls for warmup and was told to take the mound.” “I strided out to that mound”, he said as he made sure I realized that it wasn’t a slow walk. “I couldn’t wait to get there and feel the dirt under my feet”. “I felt like I owned the place and I wanted to be there.” “I wanted to throw that pitch and I wanted to look good doing it!” “I was in the moment, It wasn’t like it was 1942 again.” His pitch was firm and he told me it was short and to the left of the plate as his catcher Grimm moved swiftly to catch it on the skip. Amazingly he analyzed the pitch even more! “I felt good and confident”, he said “but I hadn’t cultivated the rhythm and the timing. “The ball came out of my hand a little late which accounted for it not reaching the plate.” However he made a point that was important to him. “I threw a line drive and my catcher had to move quickly to his right to grab it.” I commented that it must have had a little zip on it, not like he lobbed it. “Absolutely” , he said, “and that was the proof!” For Tony’s effort he got a standing ovation from the crowd! He would soon realize that his day at the ballpark was far from over! 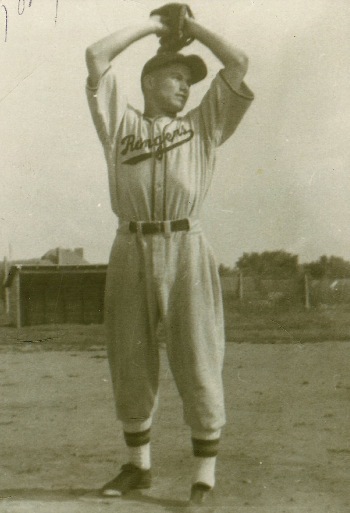 It was 1942 and Tony was pitching in a Cubs tryout camp. There were many other prospects there and originally they had put him at third base. It was an unfamiliar position for him and he made it clear to them that he was a pitcher. Finally they moved him to the mound. It was a higher mound than what he was used to pitching from for his team in Iron Mountain, Michigan. That was where he was discovered and where he received a letter for a tryout with the Cubs in Jamesville, Wisconsin. Tony and his catcher Leo Paolo were invited. “Leo could really hit but couldn’t throw or run very well”, Tony commented.. Tony was showing his skills in the game and after he adjusted to the mound nobody was getting on base. He had pitched three innings and he wasn’t able to show the scouts his abilities from the stretch to hold runners on because nobody had been on base. Suddenly a huge rainstorm came and the rest of the game was cancelled. The Cubs ended up picking five players from that camp that they wanted to give a thirty day advanced look at. All of their expenses and spending money would be paid and it was pretty much guaranteed that if they showed anything at all they would be assigned to a high minor league team. They liked how Tony pitched! He had great control and threw four very good pitches which included an overhand fastball, a sidearm curve, a 3 quarter curve that was thrown hard and broke sharply from the waist to the knees with a 6 inch break, and an overhand sinker that sharply broke down. There was a lot of movement on Tony’s pitches but the main one the scouts wanted to see was his fastball. So Tony pumped his fastball and the scouts liked what they saw and chose him as one of the five they picked. He was told to go home and relax and they would send for him. In the attempt to hide Tony from the other teams they misspelled his name and put down that he was a second base candidate. Teams did that type of thing to keep other teams from swooping in on their prospects at that time. While he was back at Iron Mountain President Roosevelt had the draft age lowered to 19. Tony ended up enlisting in the Coast Guard and received a letter from the Cubs a short time later telling him to take care of himself and they would see him after the war. When Tony got out of the service three years later he didn’t have the desire to play major league baseball anymore. He ended up pursuing a teaching career which was where his real passion was! Tony explained to me that there wasn’t any money in baseball back then. Yes, there was a chance of fame which he really didn’t desire and it was extensive travel without much monetary reward. Maybe the real turning point in his career choice happened a few months into his service duty. It was the next spring after he had enlisted when a group of ten servicemen (Tony included) were killing time playing a pepper game. Tony had brought his spikes,glove and hat along just in case he got a chance to play the game that he loved. Later Tony was warming up on the pitchers mound when someone tapped him on the shoulder. It was another serviceman with broad shoulders named Glenn McQuillen. He asked Tony to pitch to him so he could get some batting work in. Tony was glad to do it and asked McQuillen how much he wanted? Usually someone taking batting practice might want slower pitches they were sure to get the good part of the bat on. “Everything you got”, came Mcquillen’s reply. Tony was glad to test his arm out again throwing all of his pitches as well as he could! He found that McQuillen was having a hard time centering his pitches. He was hitting weak grounders and even his hits were of the Texas league variety. In other words there were no sharp hits off of his bat. Tony pitched to McQuillen for 45 minutes and even though Mcquillen was a dead pull right handed hitter he more often than not dribbled balls to second base or further to the right side. After McQuillen had given up he had a grin on his face. Tony described his eyes as “fierce like anger” as he walked to the mound and put out his hand. Tony accepted his handshake even though it was apparent McQuillen wasn’t happy. “You have a damn good curve ball”, he said and walked away. An officer came up to Tony. He knew he didn’t do anything wrong but the officer coming up to him caught him off guard. “Just a minute”, he said as he stepped in front of Tony as he was walking away. “Do you know who you were pitching to?” Honestly Tony didn’t and he told him so. 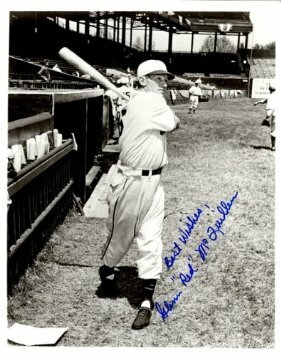 That was Glenn McQuillen of the St. Louis Browns! Tony walked away with the officers words still in his ears. He had heard of McQuillen because he made it a habit of studying the major league box scores. From that day on he knew that he had the stuff to get big league hitters out! It was all he wanted, just to know in his heart that he could have pitched in the big leagues if he wanted to was good enough for him! So we fast forward 31 years and I’m this student in his class. I am also in a journalism class with Mr. Sheldon. I’m not really sure why I took journalism. I really didn’t like it at the time. I think it was the time involved I really didn’t like. In order to write a good story you need to talk to people and get the story right. You need to find out the who, what, where, when, and how and organize it accordingly. It was just the idea that if I desired to write something I probably would have been alright. However when I’m told I had to write something it was completely different. I remember I tried to write a story about a tennis event I didn’t take time to go to. The event was a tennis exhibition where Mr. Rossio the tennis coach was playing the best girls on the tennis team. It was similar to the battle of the sexes tour that Bobby Riggs was making at the time. I winged a story without any real details about what actually happened and turned it in. Mr. Sheldon asked me point blank if I had taken the time to attend the event? Quietly and honestly feeling ashamed I told him no. Well here was another assignment and it was to write a feature story about someone. I really don’t know why I picked Mr. Gianunzio. I’m thinking the assignment was coming due and I had nobody to write about. After class one day I asked him if I could do a story about him for the paper. Usually my stories were not making the paper. They gave that space to seniors and juniors who were making the effort to write good stories. I was not either of these. However, Mr. Gianunzio was very cooperative! We decided to meet in his classroom on my lunch hour. Obviously it was his lunch hour too but he was willing to give it up for my benefit. He told me the Cubs story and how he went into the service and how he was passionate about teaching. He took me back to his roots in Iron Mountain, Michigan and how he got into teaching after his service duty. He was very easy to talk to and I could tell he liked the fact that I was doing the story about him! They had a photographer come in and take his picture and the story came out very nice with my name under the title. Recently an independent film maker was in town doing a story about Kalamazoo, Michigan. On hearing the story about Tony and the Cubs and the fact that Tony was a WWII veteran, the Cubs were contacted to verify the facts. After the facts were verified the Cubs contacted Tony about throwing the first pitch out before a game. Tony practiced some before the big day. After all he hadn’t touched a baseball in more than 45 years. 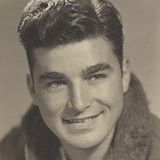 He wanted to dedicate his appearance to all of the young men who could have been major league players but lost their chance because of the war. So now we are back at the Cubs game again. Tony has thrown out the first pitch and got his standing ovation. They had asked him to write three paragraphs about his presence at the game. He did and was very satisfied as to how it came out. There was a scheduled break in the fourth inning as they were honoring Tony again. He was asked to take the field again but this time he was all by himself. He asked the lady in charge named Kaitlyn August what she wanted him to do? She answered back “anything you want to.” Her only rule was to stay between the third base dugout and third base. So Tony went on the field as the players sat in their dugouts. He was out there a good 10 minutes as he was shown on the jumbo screen in center field and the paragraphs he wrote were read. Tony walked around doing odd things like winding up and making a pitching motion to throwing the ball up in the air and catching it. He spun the ball and caught it and demonstrated how he threw his curve ball. He was a one man show and his every move was on the big screen! Tony told me that “nobody got bored!” After he was out there for close to ten minutes Kaitlyn came to get him. “You were great!”, she said. The fans once again gave him a standing ovation! When thinking about Tony and his experience at the game, I’m reminded of a story I heard from a friend. They happened to be at the mall and they spotted an elderly couple probably in their 80’s. They were offered a cream cheese pretzel and the man was all in! He actually was excited while his wife on the other hand rolled her eyes. My friend told me that from that quick observation it was very clear that the man was living and enjoying life while his wife was just trying to get through it. Tony is living and enjoying life too! He mentioned to me that the fans were great! He felt like they were with him from the beginning! The moment they saw him at 92 filled with energy and commanding that mound they fell in love with him! “They saw in me someone who was willing to make a fool of himself for the love of baseball” he offered! It was such a sight seeing him move around (not in a wheelchair as they expected) like he was 40 years younger than his actual age! Tony confided in me that he didn’t think the fans really wanted him to throw a strike. “That would be almost too superhuman”, he stated. Still I have read other articles where it was apparent that his competitive fire was still burning! “If I had another couple of weeks to train I know I could have thrown a strike with good velocity”, he stated. As one of the ever decreasing number of living world war II veterans Tony wrote a book in 2013. It is called “The Last Romantic War.” Several of his shipmates wanted him to write “our book.” Tony has a real passion for creative writing. He loved to teach it and he writes in a style that is understandable and very heartfelt! One of my questions to him was going to be what the word romantic means to him? I don’t think I have to ask him that question anymore. It seems clear that it means being emotionally attached to, caring, loving, and hurting all rolled into one. The Cubs have a rule that they don’t want anyone on the field before their time. Two or three times Tony mentioned that him and his entourage which consisted of himself, his wife, his nephew, a close friend, and four camera people had to make their way through the stands to get to their position. One time he noticed a young boy maybe 9 or 10 years old standing in front of him. It seemed almost perfect as Tony placed his hand on the boys head and gave him advice. “Play baseball and don’t stop”, he said. “You are an American!, Play baseball.” After he had encouraged the boy he looked up and behind him was the boys mother and she was crying. She gave Tony a huge hug! He confided in me that his moment with that kid and his mom was just as much of a thrill to him as throwing out that first pitch! Maybe in that moment the passion Tony had and has for teaching was revealed. Though the attention of the crowd and pitching was great, giving a one on one lesson to a kid for his benefit was just as thrilling and maybe even a little bit more so! Baseball might have brought him fame but he wouldn’t have touched the many lives he did (including mine) with his passionate teaching! Thank God that he used his life to enrich the lives of so many! When I asked Tony what keeps him going he said “find enjoyment, appreciate everything, find enjoyment!” Lesson learned Mr. Gianunzio! I have enjoyed writing your story! You made it easy just like you did 41 years ago and I did my best again! And one more thing Mr. Gianunzio, you have always belonged because the world needs people who passionately care! I shake my head admiring you because at 92 you are still teaching, still caring, still loving, still youthful, still living, and still enjoying your life! Of course those are the famous words of the song “Over the Rainbow” that Judy Garland touched our hearts with years ago. The song also is a reminder to me of a golfer named Davis Love III. Davis Love III was the son of Davis Love, Jr. who was a professional golfer. In fact Davis was born on the day his father was tied for the lead in the 1964 Masters. Davis Love, Jr. would use the game of golf to teach his sons lessons. Both Davis and his brother Mark benefited from the many lessons that their dad gave them using the game of golf as his example. Recently Davis has written a book about his wonderful relationship with his father. It is called “Every Shot I Take” which entails how much his fathers words of wisdom still come to mind! Davis played around with golf but as a teenager he decided to take the game very seriously. This of course delighted his father as he had always seen the potential his son had. Davis was able to get a scholarship from North Carolina University and he was on his way! After a couple of years Davis turned pro. As a 20 year old kid he actually thought the majors (golfs major tournaments) would be the easiest to win. He had some great wins in minor tournaments over the years but the majors eluded him for 11 years. Davis’ father was his best friend, mentor, and loving dad. Davis listened to his fathers advise intently and followed it obediently through the first years of his pro career. Then without warning tragedy occurred. His father who was only 53 was killed in 1988 in a plane crash. His father had always told Davis in his youth to “follow your dream and enjoy the trip.” Davis had learned to follow his father’s advice and was enjoying the trip. Needless to say losing him was devastating. For quite some time the joy of the game faded. 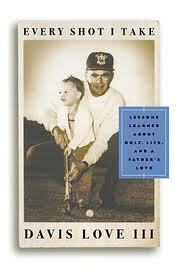 He felt like he was playing golf as a job instead of for the love of the game that his father had instilled in him. The years that followed produced victories in many minor tournaments as Davis fought to take his fathers advice and follow his dream. His father was constantly on his mind in losing and winning. In 1997 Davis was 33 years old. He had accomplished a lot in golf but had never won a major. In fact people were labeling him the best golfer who had never won a major at that time. It’s fathers day 1997 and Davis finds himself in first place by 5 strokes in a major. It is the US Open one of the most prestigious golf events and a major! His brother Mark was serving as his Caddy. The fact that he had never won a major and year after year he was reminded of it had to come to mind. Davis admitted that every time he thought about winning and what it would mean to him he would get teary eyed thinking about his father. He was very comfortable with his game but these emotions were making him lose concentration. Suddenly his lead started to shrink. Justin Leonard a young pro was making a charge and before you knew it Davis found himself just three shots ahead and facing a tough shot out of the rough. I’ve heard stories before about how people thought that God was giving them a sign. Sometimes just in a specific moment circumstances occur that you think cannot be a coincidence. I’m reminded of a pro basketball player named Joe Dumars. While his team (the Detroit Pistons) was playing in the finals in 1990 his father, who Joe was very close to, passed away before the game. Not wanting to disrupt Joe his family informed the Pistons to not tell him until the game was over. Joe had an incredible game that day and there was one particular shot his teammate Isiah Thomas remembered. “Joe shot the ball way up in the air almost hitting the roof and it went straight in the basket.” As they were running back to mid court Joe looked at Isiah shook his head and mentioned how fortunate that shot was. Isiah remembers thinking “yeah your dad made that one for you.” Now I know it sounds kind of strange, but maybe it’s not strange at all. Considering how much God loves us, why wouldn’t he at certain times give us a sign that even through our loss he is still there and still loves us? “Those last three or four holes were the hardest walk I ever had, much less play golf”, Davis admitted. He kept thinking about his father and all of the lessons his father gave him. His father had played the same course (Winged Foot) in 1974. Davis thought of encouragement he might give like “you are overdue, this is your time!” Everything was in his head except golf. Having his brother Mark on the bag may have been his saving grace. Every time he mentioned doubt Mark would say “Just keep doing what you are doing!” Davis urged Mark to just get him through this last five or ten minutes. The danger of losing snapped his attention back to golf. Finding himself in the rough at hole 13 and in danger of losing two more shots to Justin Leonard, Davis made a miraculous shot that almost went in the hole. That shot gave him confidence that whatever the situation he could get up and down. He kept Leonard at arms length the rest of the way with pars on 14-17. The commentators on my TV kept reminding us of Davis and his special relationship to his late father. After all it was fathers day and it made a wonderful story. They had been playing through the rain and on the 18th hole Davis rolled in a beautiful birdie putt to wrap up the tournament! He embraced his brother Mark in a victorious hug! “I know I never would have did it without him”, Davis later admitted. “Dad would have been so proud.” Over the 18th Green for all of the millions watching on TV to see there was a beautiful rainbow! Now I know you might say that it was just a coincidence. Consider this though before you say it was just by chance. It was fathers day for a son who missed his dad so much. It was the first and only major that Davis would win and it would have made his father so happy. It was Davis Love III taking the advice of his late father’s wisdom to reach his elusive dream. Maybe in God’s special way he was giving a sign that all is well! I know one thing, as I was watching my TV showing that beautiful rainbow and Davis hugging his brother tears were rolling down my face! 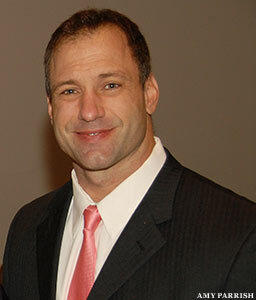 Stefanie Spielman was thirty years old and the wife of a famous NFL player named Chris Spielman. Stefanie was pregnant when she discovered a lump on her breast. Later she would miscarry and get her worst fear, a cancer diagnosis. 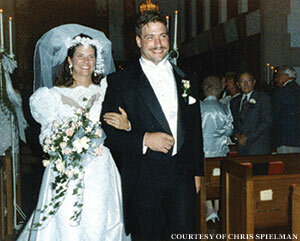 Stefanie and Chris had a storybook life together. Their love blossomed even though they were often apart. Chris with his football career that he loved passionately and Stephanie as a mother of four and model. Even though Chris didn’t like public attention, he was getting it from his tremendous football exploits. Chris admired Stefs outgoing personality and the way she could be the center of attention. 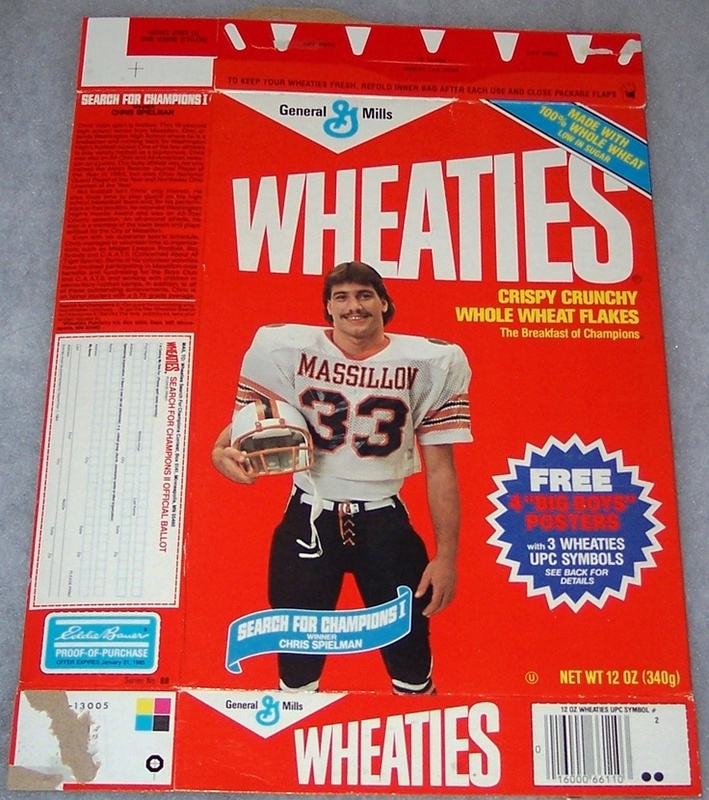 To his surprise Chris was asked by a local booster Jack Gorius if he would be OK with Jack starting a campaign to get Chris on the Wheaties box? “Sure, why not?”, was Chris’ reply thinking nothing would come of it. The booster was interested in getting their town of Massillon, Ohio on the national map. Chris was surprised when the town caught fire for the idea and campaigned for the story vigorously. Between his junior and senior years in high school a Wheaties box was made with Chris on the cover! Chris continued his football excellence at Ohio State University. His relationship with Stef grew and they repeated their vows on their memorable start of married life! Although Chris was so dedicated to his football career and improving his game he did his best to be a good husband and father. Four kids followed and it was not easy to balance because Chris had to be away most of the time for six months. However, they both adjusted to the situation and loved each other and their kids very much. Year after year it was the same routine, first in Detroit and then in Buffalo. He was born in Canton Ohio and that was where he was sure his legacy would end up. Canton Ohio is the home to Football’s Hall of Fame. Then the tragic news of the cancer discovery came. Chris had set aside his football career but the change was not easy. He found himself watching two or three games every Sunday and thinking about the game that he loved. He was also finding it hard to care for the kids when Stef couldn’t. Being away from them for mostly six months at a time had taken it’s toll. They were used to mommy helping them and had a hard time adjusting to Chris. Likewise Chris had a hard time adjusting to the tasks that Stef did without thinking. Tasks like the laundry and cooking. Chris found that his football training knowledge came into play here. It didn’t always look pretty but step by step much like football he could usually get the job done. He felt very humbled by his lack of knowledge and skills but he muddled through the tasks as best he could. Stef had a hard time with losing her hair as chemo treatments usually cause. One day when a bunch of her hair came off in the hands of one of her children she decided to have a “Hair Picnic”. She had her whole head shaved. As her kids watched and ate peanut butter sandwiches, Stef watched in a mirror as the hair that won her modeling jobs all around the country and Greece was swiftly chopped away. The idea was that she would control when her hair came out, not cancer! Chris arrived a little late because in a support of solidarity he had just had all of his hair shaved off too. He figured that it would draw some attention away from Stef and onto him. It was during this first year of chemo that Stef shared her thoughts in a journal. Although the chemo was having devastating effects on Stef, Chris was there to encourage her! He made it a point to keep telling her that the chemo was the good guy. That it was their ally! Stef bought in because she was willing to go through anything to resume her life with her family. After the year away Chris was anxious to resume his football career and Stef was anxious to get on with life. She had her last treatment and they celebrated. Her cancer was now in remission and everyone was happy! Chris diligently got ready for the 1999 season. He would be playing for his hometown Cleveland Browns. His comeback from spinal neck fusion surgery didn’t last long. In an exhibition game against the Bears he was blindsided by the Bears center. Spielman remained prone on the field for several minutes before walking off on his own power. 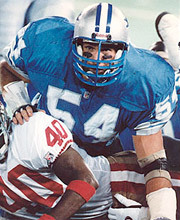 He told his former teammate from the Lions Lomas Brown that he had been temporarily paralyzed. Days later Chris announced his retirement from the NFL. He had given all that his body had to offer and he couldn’t give the game anymore. He was getting out while he could still walk away. This whole cancer experience was having a deep spiritual effect on Chris. He had shamefully realized that football had really been his God through the years. He had played it since the age of nine and he religiously did everything he could to get better. Although he loved his wife and family football was his God. Now he was forced to deal with the real question “What is my purpose?’ He struggled with the question of why God was putting him and his family through this? He wished he could be as strong as Stef who seemed to see a purpose in this whole ordeal. He dedicated himself to the cause of helping find a cure for cancer. Stef and Chris’ story began to take a national turn as they both dedicated themselves to raising money for the cause. They also wanted to expand the education of the disease. As determined and dedicated as Chris was in football he became even more so to the cause. He forced himself to be more of an upfront person as he and Stef went on national shows such as Oprah. 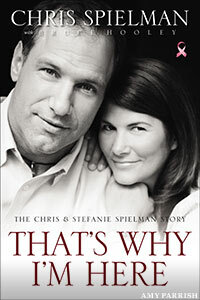 Stefanie established the Stefanie Spielman Fund for Breast Cancer Research in 1998 considering it a life mission to improve research and awareness. 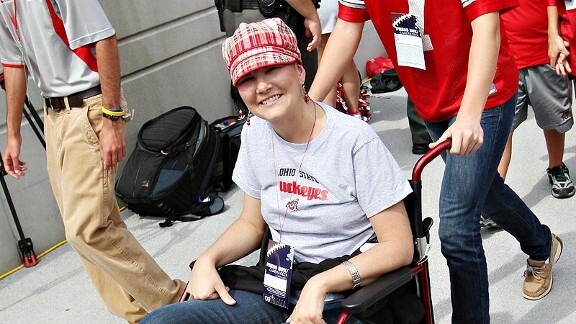 At the time she stated “I know there is a reason God gave me breast cancer, and I’m supposed to do something with it.” She shared her story through the years throughout Central Ohio and the fund accumulated more than 6.5 million dollars for breast cancer research, education, and patient assistance at Ohio State University’s Arthur G. James Cancer Hospital and Solove Research Institute. There was another important award that Stef established. 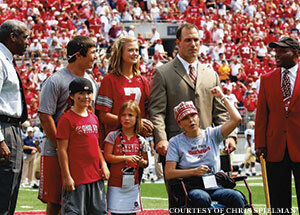 It was called Stefanie’s Champions and it was a yearly award for the caregivers that gave so much to the patients. Stefanie lovingly gave the first award to Chris as her way of saying thanks. It was a constant fight for Stef through the years. The cancer would go into remission only to start back up again. Still she went to events as her body let her. One time Chris noted a firm and direct answer that Stef gave a recent cancer patient. The young lady was asking Stef questions and suddenly became concerned thinking she was bothering her. Stef put a grip on her hand and said these words, “Don’t you know this is what I’m here for?” After four re-occurrences through eleven years the doctors let Chris know that this time it was terminal. Ironically there was a little good news in 2009. Chris had been elected to the College Football Hall of Fame! As sick as she was Stef willed herself to be part of Chris’ celebration. She needed to be wheeled out to the field but she was there with Chris and their children to honor the man that she loved so much! It was November of 2009 and Chris was preparing in his mind for life without Stef. It was hard and yet their faith in God gave them hope for the after life. 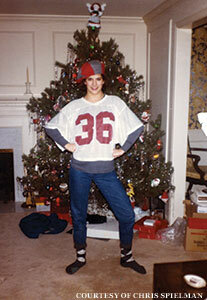 Stefanie Spielman died in November of 2009. Before she did as both knew what the outcome would be Chris asked Stef a heart wrenching question..”Was I a good husband?” “The best”, she answered without hesitating. Those simple words of praise meant more to Chris than all the football fame he ever received!